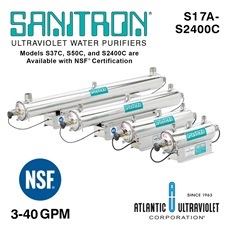 In recent years, some requirements call for the uv water purifier to be certified to a third party standard most notably, NSF (National Sanitation Foundation). 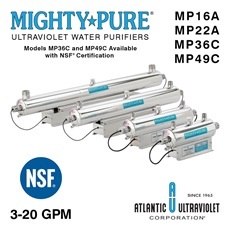 Atlantic Ultraviolet Mighty Pure 12 gpm (MP36C) and 20 gpm (MP49C) uv water units are certified to both NSF® Class B and ANSI Standard 55. Each uv water system includes a NSF certified flow control valves. 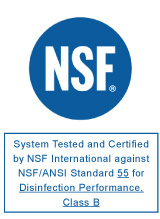 NSF/ANSI 61 is a set of national standards that relates to water treatment and establishes stringent requirements for the control of equipment that comes in contact with either potable water or products that support the production of potable water. NSF/ANSI 372 was set in 2011 to establish procedures to meet the 0.25% lead content requirement of the RLDWA (Reduction of Lead in Drinking Water Act) using a wetted surface area average calculation or just simply using all no-lead materials for areas in contact with drinking water. 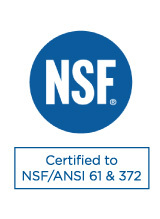 NSF/ANSI 372 includes a broader scope of drinking water products covered by the law which may not be covered under NSF/ANSI 61 and enables large or complex products and assemblies to achieve certification. 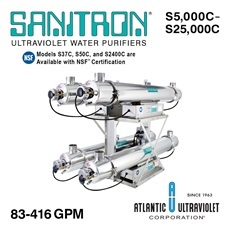 Atlantic Ultraviolet’s SANITRON line of water purifiers, 12 gallons per minute (gpm) and higher, have been tested and certified to NSF/ANSI 61 and NSF/ANSI 372.